Every year, millions of people make New Year’s resolutions. Every year, most of those resolutions fall by the wayside. Lots of us don’t even bother making them, because we expect them to fail. So how do you make a resolution stick? The first thing I’d like to stress is that resolutions should not be restricted, delayed or postponed to New Year. I understand that it’s a good time to make a resolution: a new year is starting and it makes sense for us to ‘start anew’. However, the widely bought-into belief that New Year is the time is almost as powerfully accepted as people’s inability to maintain whatever it is they resolve to achieve. I prefer that we should commit to that which we want at any time, and that time is usually when we have a clearly defined desire to make it happen. Because it’s this desire for change that enables us to commit to make things happen. Desire is the fuel that drives change. In my book, Pieces of the Possible, I tell the story of Tom, who is presented with an opportunity to make changes in how he approaches his life and relationships. Through the ongoing dialogue with his guide, Gabriel, the reader is taken on a journey on how to best commit to personal change. Become aware of what has contributed to things being the way they are: you having what you have or being the way you are. This is what I refer to as the ‘truth of your today’. Become aware of the choices you have made that have led you to this truth. Become aware of the patterns that you, yourself, have put in place that reinforce this truth. Become aware of factors outside of your influence which have also contributed to this truth. Accept the truth of your today. This does not mean you have to like or approve of these factors, it just means that you accept that they have led to the truth of your today. By naming and accepting what has influenced you and the behaviours that reinforce this truth, you move forward in your ability to let go and choose the changes you’d like to make. The only way to make change happen is to truly want it, to desire the difference. Once you achieve a state of desire around something, a shift takes place internally that frees you to commit to making change happen. This is where we resolve to make something be different and it is absolutely fundamental to making resolutions successful. The challenge that lies ahead for anyone resolving to change is the deep-rooted patterns of behaviours and beliefs we’ve all spent years establishing. As you move forward, you will be pulled back to old ways by these patterns; in fact, they can be so powerful that you’ll sometimes default to them unconsciously. Desiring change will certainly help you overcome some of these patterns, but you improve your chances of success dramatically by believing you can achieve and deserve that which you desire. The future is created by the choices we make from moment to moment. Indeed, the truth of your today has been created by the choices you made in previous moments. Therefore, you must commit to keep on choosing the change you desire. Every time you encounter old patterns of belief and behaviour, you can overcome them by choosing the difference. As you wake, choose to change. As you encounter difficulties, choose to change. As you notice old patterns, keep choosing to change. Why do people fail? Because we are all human and prone to letting old, established comfort zones pull us back to old ways of being and doing. The successful among us create enough desire and belief that they are committed to achieving the change. They make a conscious decision in each moment to be the new version of themselves, having what they want. But because we are all human, they forgive themselves when they forget, or when they weaken. When something falls by the wayside or they stumble on their journey, they pick themselves up, recognise what caused them to fall and recommit to moving forward positively. It’s a continuous process and it isn’t always easy, but take this approach to your New Year’s resolutions and you really can make the change you’re dreaming of. 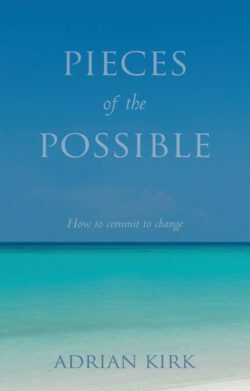 Pieces of the Possible is available in paperback and e-book, or as a free audio-book download. Head to the top right of this page to receive your copy, and please do share the advice you’ve found here with anyone you feel would benefit.